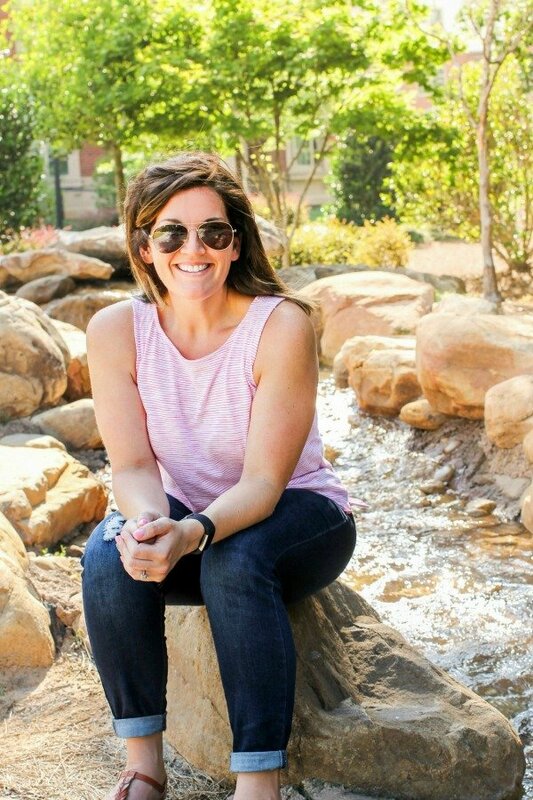 April 10, 2018 By Allyson 26 Comments This post may contain affiliate links. Read my disclosure policy. Since I was a teenager, I’ve LOVED Buffalo Chicken anything! In fact, I would literally try to come up with recipes JUST to use buffalo sauce, legit, right? These Instant Pot Buffalo Chicken Lettuce wraps are easy to make, healthy (163 calories per serving AND 28g protein! ), and utilize my current favorite appliance, the Instant Pot . 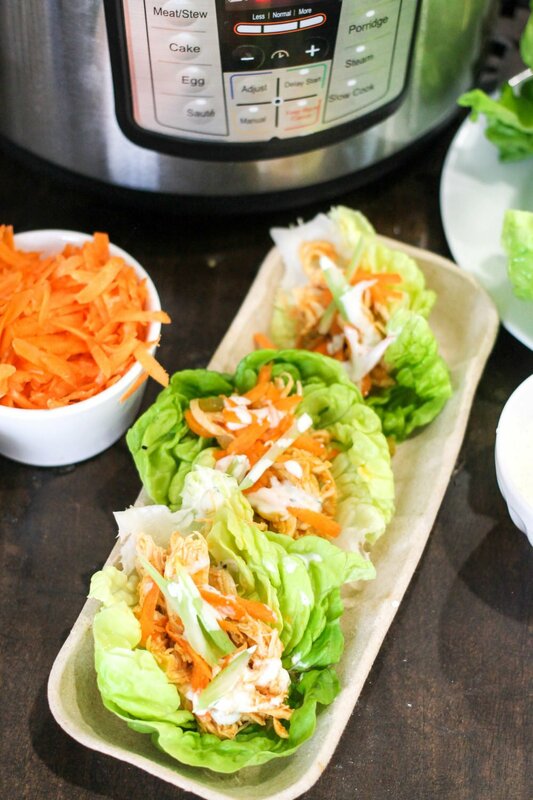 Your whole family will love these Buffalo Chicken Lettuce Wraps! Like I mentioned, making these easy Instant Pot Buffalo Chicken wraps takes very little effort or time. Using your Instant Pot, add the chicken breasts, carrots, celery, onion, and buffalo sauce to the instant pot, then cook for 15 minutes on manual. Once the time is up, remove the chicken breasts and shred the chicken. Add the chicken back to the pot, then stir to coat with the sauce. 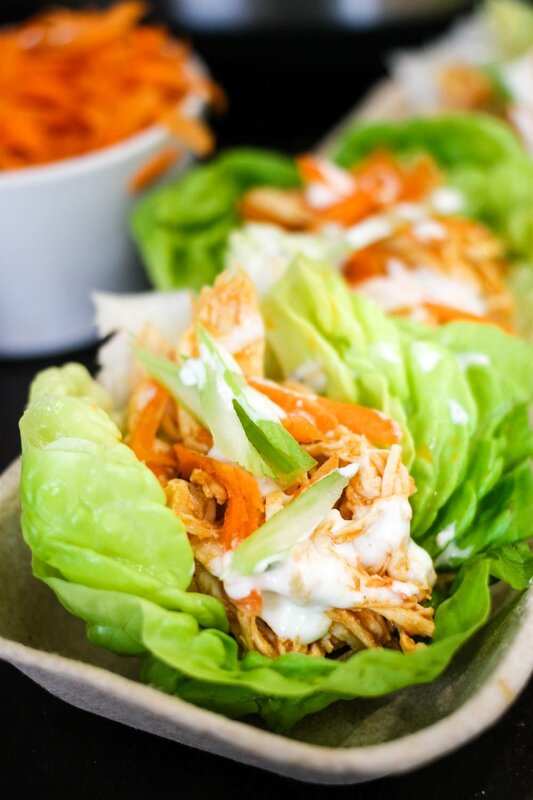 Load up fresh bib lettuce wraps with the buffalo chicken, grated carrots, and sliced celery if desired. Add delicious homemade ranch or homemade blue cheese dressing (BEST RECIPE EVER RIGHT HERE) to the top! Since this buffalo chicken doesn’t have too much liquid, it shouldn’t take too much time to come to pressure. It needs to heat the buffalo sauce, which shouldn’t take too long. For me, it took about 10 minutes for the pot to come to pressure. Once it comes to pressure, the cook time will start to count down. When the recipe is finished, you can either natural release the pressure, which will take about 15 more minutes, or you can quick release the pressure. Are Instant Pot Buffalo Chicken Lettuce Wraps healthy? Yes! Buffalo Chicken lettuce wraps are seriously low carb (4 net grams), only 162 calories for THREE wraps, and packed with 28 grams of protein! Instant Pot Buffalo Chicken Lettuce Wraps are definitely a very healthy option for lunch or dinner! These would even be great at a dinner party! They are also gluten free, paleo, dairy-free, grain-free, and Whole30 compliant! 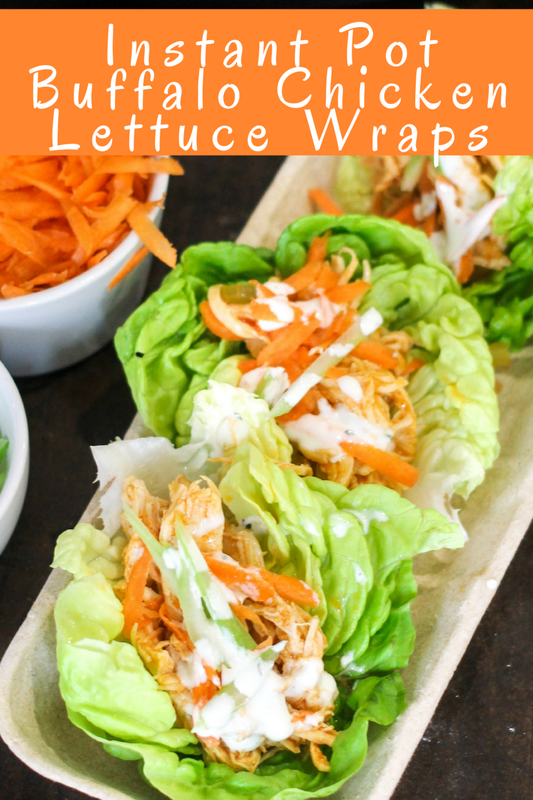 These buffalo chicken lettuce wraps fit into pretty much everyone’s diet! Can I make Buffalo Chicken Lettuce Wraps in the Slow Cooker? YES! If you would rather have the chicken cooking all day because you are at work or won’t be able to pay too much attention to the cook time, making these in the slow cooker is a great solution! I actually have a recipe for Slow Cooker Buffalo Chicken Lettuce Wraps HERE! Looking for more ways to serve instant pot buffalo chicken? Use instant pot buffalo chicken in this delicious creamy buffalo chicken lasagna! This is a family favorite! Need an amazing game day appetizer?! These Buffalo Chicken Fries will be a HIT at your next football party or tailgate! Looking for a lunch option? This Gluten Free Buffalo Chicken Grilled Cheese is always a hit! Instant Pot Enchilada Soup is hearty and delicious, yet low calorie and vegetarian. Most of the ingredients are pantry staples, and it’s very inexpensive as well! See options to add meat as well as cook on the stove top or in the slow cooker! Using the Instant Pot, add chicken breasts, celery, carrot, onion, and buffalo sauce. Lightly stir to get sauce under the chicken. Close lid, seal pressure valve, and set on manual for 10 minutes. Start. When time is up, either naturally release pressure, or manually release it by flipping the valve (careful!). Remove the lid, then remove the chicken breasts and place on a cutting board. Using 2 forks, shred the chicken. Add shredded chicken back to the pot with the buffalo sauce mixture; stir to coat. Scoop 1/4 to 1/3 cup of chicken into each lettuce wrap, top with grated carrots and diced celery if desired. Add ranch or blue cheese* over the top of the chicken. Serve immediately! *Nutritional information does not include ranch or blue cheese topping. 163 calories, 4g fat, 6g carb, 4g fiber, 28g protein. Using the Instant Pot makes getting this on the table so much easier! Such a flavorful meal! My husband is a buffalo sauce addict…..he’s going to flip when he sees this for dinner! I love that I can make this in my instant pot! I can’t wait to try! My kind of meal!! I love that I can make it in my Instant Pot! Such a great way to enjoy buffalo chicken flavor! This recipe makes me want an instant pot! 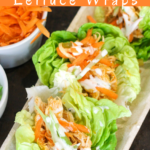 I love lettuce wraps and I love buffalo chicken so I definitely need to make this soon! This looks amazing! I am however new to the lettuce wrap world and have just been peeling it straight from the head of lettuce, is there a certain brand that has them made? What is bib lettuce wrap? Sorry that probably sounds dumb. Thanks! This is NOT dumb AT ALL! So what I typically use is bib lettuce, which is more like a little pocket. You are going to find them in a plastic container ‘growing’ – it’s usually called hydroponic lettuce. You can find it in the produce department, and this is what it typically looks like. If you can’t find it, then I would recommend using long romaine leaves, that would work too! I love your take on this, and the lettuce wrap is my new favorite way to eat a taco. I think I like it even better than the taco shells. I don’t actually miss the crunch. Well done! looking for the buffalo sauce recipe?? I typically buy buffalo sauce at the store. I like Franks wing sauce which has the fewest calories! Otherwise you can make buffalo sauce by combining hot sauce and butter! This looks so good! Is it real spicy? trying to see if i could get my kids to eat it? Buffalo sauce definitely has a kick! My kids like it, but if yours dont like spicy they may be reluctant! I suggest you try this sweeter version! oh the sweeter ones look perfect! Thanks! They don’t, but if you are used to cooking a shorter time, feel free to do that, too! I used a package of chicken tenderloins and left out the onion (allergic) it turned out amazing! And really quick to make, great for a summer dinner! Thank you for sharing the recipe! I am so happy you loved it! I have been making it all summer too! This is another great one if you are into healthy meals! Mine keeps saying burn! How do I keep this from happening? Yikes! I’ve never had that problem. There are a lot of factors I guess- what size pot are you using? If 8qt, you might need to add more liquid. You could also just opt to cook the chicken in broth first, then add the sauce after. Wow Fred is such a tool. I think you’re doing great Allyson! Don’t let the trolls get ya down. Also I’m gonna try and thaw my chicken while I run to the store, but do you know if this recipe works the same with frozen chicken? Tabitha- Ha, I know right?! Yes, It should work the same! Set the timer for 13-14 minutes and make sure the breasts aren’t all clumped together! Delicious! I used chicken broth instead of water because I had some open and needed to use it up. Shredded the chicken with an electric mixer in s separate bowl as recommended by another similar recipe. This is genius!! Loved putting the chicken in a lettuce wrap. Not sure if it’s just my instantpot but I don’t have manual. I have pressure cook, low or high pressure. Use high pressure in that case!